For example, Melissa & Luke both gave a rather cautionary seal of approval – as it were – to blogging as a means of self-promotion. 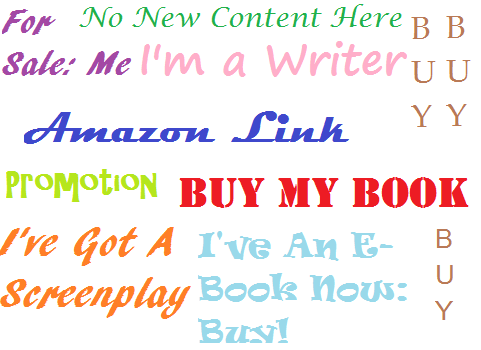 Melissa suggested that a writer needs to avoid their blog simply being a thinly veiled ‘‘Buy My Book’’ and instead advocates the need for a personal response to the themes explored in one’s book. Therefore, in order to constructively use one’s blog as a method of self-exposure, it is necessary for it to exist in and of itself and not merely to serve the purpose of promotion. This sentiment was shared by survey participants who stated that though they used their blog for self-promotion it was through – for lack of a better word – indirect means. They used their blogs to promote various causes, to explore themes similar to those explored in their works, or to reach new audiences that were outside their writing’s expected realm. Therefore, it would seem that in order for blogging to produce a ‘value’, it needs to give the reader something original and new in itself. It’s a place where writers can ‘showcase’ their ability. However, naturally, this can also have a negative outcome just as easily (or perhaps easier) than a positive one. Luke warns, ‘don’t promote crap. Getting something bad you’ve written noticed by an editor can be just as bad for your career as getting something well done can be good.’ Therefore, from a monetary perspective, a writer’s chances of getting published are dependent on the quality of what they produce. This would seem like a natural progression and one of the main advantages for worthy writers getting their work noticed. It would seem that blogging, in this sense, doesn’t devalue an author’s work and instead has the effect of making the evolution of an author’s commercial potential and ability more transparent for the reader. It can be argued that blogging is changing the face of how writer’s work is being noticed. However, it is not devaluing it – if the author’s work is to a high quality anyway. A best-selling author who began with self-publishing. Unfortunately, the ‘one’ declined to comment further.